Michele Bachmann's Anita Bryant Moment » I Mean…What?!? Tyra Banks, move over. We are now watching the ultimate beauty contest between Sarah Palin and Michele Bachmann as they go toe to toe in the hopes of becoming America’s Next Top Model… Citizen? Now all we need is a segment with Miss J Alexander as he shows the hopefuls how to walk up to the podium with grace, turn, nod to constituents, wave ever so slightly, then walk off stage without answering any questions. There is little difference between these two ladies when you stop, look and listen to them. Welcome to our newest reality show, model camp meets political aspirants. Reese Witherspoon‘s character Tracy Flick from the film, Election would be a great contestant. 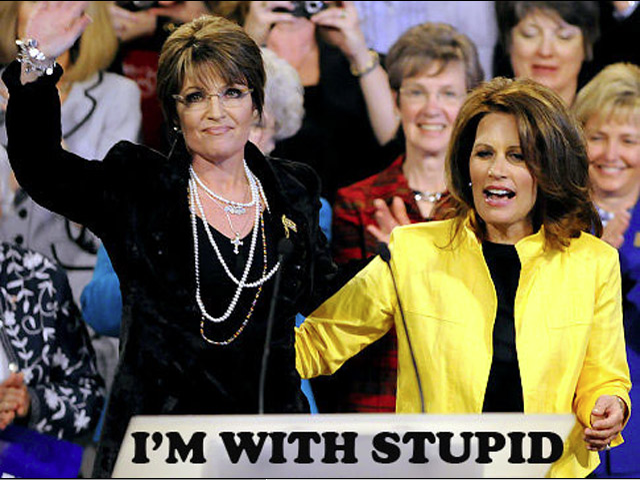 Though Michele and Sarah pale in (Palin) comparison to Tracy. The prize in this contest is a talk show on the Fox News Channel. As God is my witness, neither of these two beauties will go on to become America’s Next Top President, either. I don’t care what Bill Maher says. The biggest reason is that there is little difference between the two of them and ultimately they will crosshair each other out. Perhaps the biggest difference between these two are their spouses. Sarah’s husband, Todd is bone straight while Michele’s husband, Marcus acts like a reformed homosexual. Well, why else could he teach that class and make it his business? One does not make something their life’s work without having lived to tell the tale. Look at Betty Ford (The Center) or Bill W (Alcoholics Anonymous) in regards to drug and alcohol addiction. On the other end of the spectrum there is John Walsh from America’s Most Wanted, who’s child was abducted, so in turn he created a platform to help those who suffered similar circumstances. Examples such as these are innumerable of people who take it upon themselves to help others survive life’s traumas. It is wanting to help those who are in the same boat as them, and in the case of Marcus Bachmann, that boat might just be the Atlantis Gay Cruise Ship. So far every time I see coverage of Mr. Bachmann, he is talking about gays, how his daughter dresses or dancing. Come on, girl. Don’t you think that he had to have been a follower of Satan in order to have seen the the light? Hence, teaching the class, Butch 101. Based on all the gay bashing that is coming out of the Bachmann camp (besides the modeling one) it is up to the gay community to put the kibosh on Michele Bachmann’s campaign once and for all. Let us call this Michele Bachmann’s Anita Bryant moment. Who can we boycott!